On Tuesday, October 22, 2013 Apple had an event where they made several announcements. The highlight of the event was the iPad Air and iPad mini with Retina display. In this blog post I will recap what was announced and share my thoughts. The iPad Air is the new large screen iPad. The iPad Air offers numerous improvements over the previous large screen iPad (iPad 4). I am most excited about the new A7 processor because I have an iPhone 5S which has the A7 processor and it is extremely fast! I am also looking forward to the iPad Air being lighter than its predecessor. The iPad Air will come in two diffrent colors: Space Gray (black front) or Silver (white front). The iPad Air will be available on Friday, November 1st. Pre-orders are not available for the iPad Air through Apple. The best way to get an iPad Air would be to head to your nearest Apple Retail Store or carrier store (AT&T, Sprint, T-Mobile, or Verizon) the morning of November 1st. I will be purchasing a space gray iPad Air Wi-Fi with 32GB of storage. I am choosing space gray to match my iPhone 5S and for the first time will be purchasing the 32GB model (normally I buy the 16GB model but I think having a little extra storage may come in handy). I am choosing the iPad Air over the iPad mini with Retina display because I like the slighly bigger screen over the iPad mini. The iPad Air and iPad mini with Retina display are identical now except for the screen size. If you are looking for the smallest and most portable iPad I would highly recommend the iPad mini. The iPad mini with Retina display will be available later in November. My gut feeling says we will see it become available on Black Friday and it will be in short supply. Your best bet to get one when they are available will be to head down to your local Apple Store. My wife Britta is already asking if we can sell her iPad mini and purchase an iPad mini with Retina display. She says that the non-Retina display on her iPad mini isn't very good compared to her iPhone screen and she would like to upgrade. Apple announced that the newest version of the Mac operating system called Mavericks would be available for FREE starting on 10/22/13. Mavericks offers 200+ new features! OS X Mavericks is available as a free download from the Mac App Store. It’ll run on a 2007 iMac and MacBook Pro or later; 2008 MacBook, Macbook Air, or Mac Pro or later; and the 2009 Mac mini or later. I have updated my 11-inch MacBook Air to Mavericks and have been using it for the past week and it has been fantastic! I have noticed improved battery life (one of the major features) and I have been very happy with the significant improvments to Safari, Mail, Calendar. Before upgrading to Mavericks, I would recommend that you make sure you have your Mac backed up fully just in case something went wrong in the upgrade process. Apple has instructions on how to upgrade to Mavericks on their website. Apple announced new versions of the iLife (iPhoto, iMovie, & GarageBand) and iWork (Pages, Keynote, & Numbers) apps for both the Mac and iOS devices (iPhone & iPad). Check the App Store on your device to update. For those who have not purchased these apps they are now FREE with the purchase of a new device. The iWork apps (Pages, Numbers, and Keynote) now offer full file-compatibility between OS X, iOS, and PCs (via iCloud website). This means I can start a document on my Mac and finish it on my iPad or another computer. The iPad 2 will continue to be available for sale at the price of $399. I would not recommend that anyone purchase this iPad at this point. I believe that it is still offered because businesses will purchase it if they want a bigger screen iPad for a specific purpose and want to save money. Educational institutions seem to be buying the iPad 2 for students as well. I would advise someone to purchase the iPad Air or the iPad mini with Retina display. The iPad mini (without Retina display) will continue to be available for sale at a reduced price of $299 (original price was $329). Again, I would recommend that a person purchase the iPad mini with Retina display if they can afford the extra $100. It is worth the extra cost! On Tuesday, September 10, 2013 Apple had an event where they made several announcements. The highlight of the event was the iPhone 5C and iPhone 5S. In this blog post I will recap what was announced and share my thoughts. iOS 7 is a signficant change to the software that runs our iPhones and iPads. Apple has not only changed the look and feel, but also redesigned the way many things work to make the experience of using our devices even better! iOS 7 will be available on September 18th and can be downloaded for free. Apple will release iTunes Radio on September 18th alongside iOS 7. It is very similar to Pandora. It is built into the Music app on your iPhone and iPad. You can create your own station, customize the station, or listen to over 300 DJ-curated stations. iTunes Radio will play the occasional ad unless you pay for iTunes Match. The iPhone 5C features a 4-inch Retina display, A6 chip, and an 8-megapixel iSight camera (the iPhone 5C is basically the same as the iPhone 5), as well as an improved FaceTime HD camera on the front. Unlike the iPhone 5 that came before it, it is made of a single piece of polycarbonate and will be available in 5 colors (white, pink, yellow, blue, and green). The iPhone 5C will be available to preorder on Friday, September 13th. Pre-orders typically have sold out quickly in previous years. If you pre-order the phones will be delivered on September 20th. You could also head to your nearest Apple Retail Store or carrier store (AT&T, Sprint, T-Mobile, or Verizon) the morning of September 20th. I think the iPhone 5 was a substanial upgrade over the iPhone 4S and iPhone 4. The iPhone 5C is essentially an iPhone 5 in a colorful plastic shell for a little less money. The new features of the iPhone 5S are designed to make the iPhone faster (A7 processor), easier to use (TouchID), and a better camera. I am very excited about the improved camera. Most people these days use their smartphone as their primary camera and any improvement in the iPhones camera technology means better photos for millions of people. I think that TouchID will make life easier as you no longer have to type in a 4 digit passcode to unlock your device or type in your Apple password when downloading apps, songs, movies, and ebooks. The M7 Coprocessor knows when you’re walking, running, or even driving. For example, Maps switches from driving to walking turn-by-turn navigation if, say, you park and continue on foot. 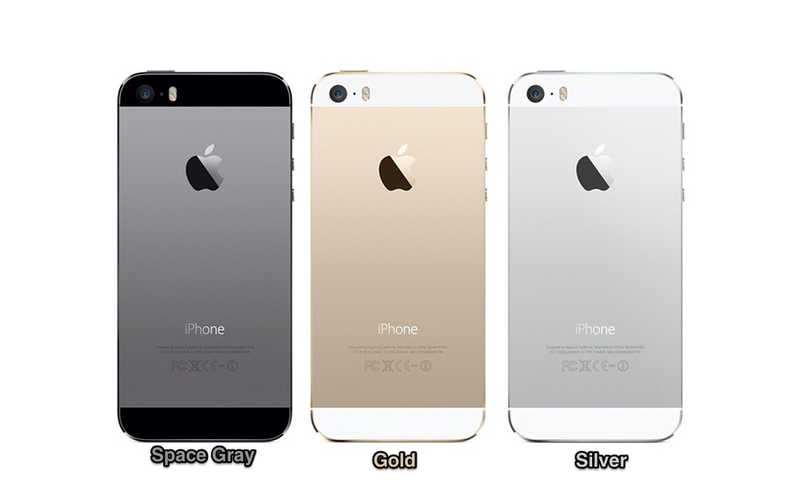 The iPhone 5S will come in three diffrent colors: silver, gold, or space gray. VOTE ON WHAT COLOR MIKE SHOULD BUY! This is a value of $40. On Monday, June 11, 2013 Apple had an event where they announced numerous new products. The highlight of the event was iOS 7. In this blog post I will recap what was announced and share my thoughts. iOS 7 will be availble this fall for free. It has been a few years since I have been this excited about something that Apple has announced. I think iOS 7 will significantly improve the way we use our devices and will lay a foundation for the next few years of advancements! Learn more about iOS 7 on Apple's website. OS X Mavericks (10.9) will be availble this fall. Apple has ran out of cat names so they will now name OS X after places that they love in California. Mavericks is a beach known for some awesome surfing. Mavericks appears to be a great update for all Mac users. I am especially excited about the Advanced Technologies. It sounds like Apple has come up with some neat ways of increasing the speed and battery life our Macs. Learn more about OS X Mavericks on Apple's website. This fall when iOS 7 is released, you will be able to use iTunes Radio. iTunes Radio is like Pandora, but built right into the Music app on your iPhone or iPad. You will be able to play music from a wide variety of pre-built stations or you can create your own station based on a particular artist or song that you like. iTunes Radio will be free but supported by ads or ad free if you are pay for iTunes Match. Learn more about iTunes Radio on Apple's website. Apple announced updates to the MacBook Air line. The most sigficant difference is the battery life. The 11-inch MacBook Air improves to 9 hours (from 5) and the 13-inch MacBook Air improves to 12 hours (from 7). I will be purchasing a new 11-inch MacBook Air this week to take advantage of the massive increase in battery life. Britta will take over my 2012 MacBook Air and we are selling the 2010 MacBook Pro. On Wednesday, September 2012 Apple had an event where they announced numerous new products. The highlight of the event was the iPhone 5. In this blog post I will recap what was announced and share my thoughts. One of the reasons that I love Apple products is that they are designed by people who use the products they build everyday. Apple has improved every aspect of the iPhone 5 compared to previous versions. The iPhone 5 will be available on Friday, September 21st. Pre-orders sold out within an hour. The best way to get an iPhone 5 without waiting weeks for it to ship would be to head to your nearest Apple Retail Store the morning of September 21st. In the United States the iPhone will be available on AT&T, Verizon, and Sprint along with some smaller regional carriers. If you don't currently own an iPhone and are looking to purchase one get the iPhone 5. Don't bother trying to save a minimal amount of money by getting the iPhone 4 or iPhone 4S as the majority of the cost of a cell phone is not in the upfront cost but in the cost of the 2 Year contract. Don't be penny wise and pound foolish. I believe that anyone that has an iPhone 3G, iPhone 3GS, or iPhone 4 would benefit from upgrading to the iPhone 5. If you currently have an iPhone 4S I would encourage you to wait an additional year for the iPhone 5S. iOS 6 is the sixth major version of the software that runs your iPhone, iPad, and iPod Touch. It is a free upgrade and will be release on Wednesday, September 19th. iOS 6 is compatible with iPhone 3GS, iPhone 4, iPhone 4S, iPad 2, the new iPad, and iPod Touch (4th Generation). Apple will update the look and feel of the iTunes Store, App Store, and iBooks Store on Wednesday, September 19th. It will be easier to search and discover new content. iTunes 11 for Mac & PC will be available in late October. The new iTunes will feature easier navigation, a cleaner interface, and a new mini player. Apple typically announces new iPods each fall. In 2011, Apple largely left the iPod lineup unchanged from the year before. This year Apple made some big changes to the iPod lineup. The iPod Nano comes in seven different colors and will cost $149 for 16GB of storage. These will be great gifts for the music lover who wants something that they can use while walking or jogging. The battery life is fantastic and the interface will be easier to use than the previous generation with the super small touch screen. The iPod Touch has always been an "iPhone without the phone". It's been two years since the last major update to the iPod Touch. This fall Apple showed some love towards the iPod Touch and is giving it a massive upgrade. The iPod Touch 5th Generation will come in six different colors. The iPod 4th Generation remains in the lineup. I spend alot of time working with middle school and high school teens at church and I can confirm that teens love the iPod Touch. It gives them the ability to watch videos, surf the web, check Facebook, play games, and listen to music (what teen doesn't like listening to music?). The iPod Touch 4th Generation is two year old technology and I would encourage buying an iPod Touch to pay the extra money for the iPod 5th Generation. It appears to be a much better product for a bit more money. The iPod Shuffle in my opinion reached it's optimal design back in 2006. Apple experimented with an even smaller design that had no buttons and that was a failed experiement so in the fall of 2010 they went back to a very similar design as the one they came out with in 2006. This fall they are just changing the colors available to match the colors that the iPod Touch and Nanos come in. You can pick up an iPod Shuffle for $49. That will get you 2GB of storage and a set of Apple Earphones. Considering that Apple Earphones are $29 by themselves I always encouraged people to just buy a Shuffle for the extra $20. Just something to think about. Note: The iPod Shuffle comes with the older Apple Earphones not the new Apple EarPods. Apple spent three years designing the EarPods. The early reviews are saying that they are an improvement upon the Apple Earphones that have come with iPhones and iPods in the past. They will come with the iPhone 5, iPod Touch 5th Generation, and iPod Nano. You can also pick up a pair for $29. The new iPod Touch, Shuffle, and Nano come in (Product) RED. $50 million from Apple products has been donated to (Product) RED to fight Aids. To learn more check out Apple's website.